I am new to the community and honored to be here. 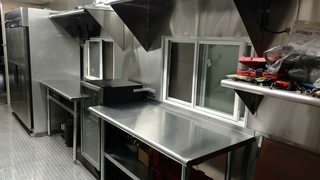 My wife and I are currently planning building out our first truck. For what we are doing, refrigeration is number one importance, so we're looking for a full-height refrigerator. The only kicker is that most of the units I am seeing (I have been looking at webrestarauntstore.com) are 82.5 - 84 inches, while the trucks I am looking at (Freightliner MT45) has a box with an interior height of 82 inches. Is this a problem others have run into? 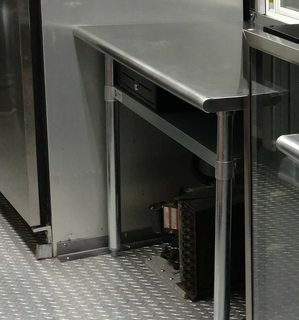 Do you have any recommendations on refrigerators that might fit, or do most folks work with taller trucks? I appreciate your advice. True t-19 is 78", just make sure you can clear the door. Just had to deal with this problem recently on a build. Our ceiling is 79 3/4" an our vertical freezer was 84" with the 5" wheels. So we removed the wheels and put adjustable height bolt legs instead. So its not going anywhere. But we had to crack the plexiglass skylight to get it upright because of a low AC unit and short rear doorway. Now its in place and pined in by the safety cage and AC unit. Which I had to disassemble to get it in and I have to trim the plastic AC case so that it fits back on. Plus the new skylight was $200 but is by far the best freezer we've ever used. Here's what I ended up doing...I modified my "USED" refrigerator. WARNING, this is not for the faint of heart! I wouldn't recommend doing this to a new fridge :) So I cut about nine inches off of the bottom of mine and relocated the compressor to sit beside it. There was enough copper coil running from the compressor to the fridge that I only needed to bend it out a little, well, a lot. I just tucked the compressor under the serving window table and ran the refrigerator drain tube through the floor so there would no need for the drain pan either. My unit is a True T-49 double door. The reason I went so large is because based on my menu I could not justify really needing a freezer. My food would go from refrigerated to cooked not frozen to cooked. I may be missing something here so if anyone has some input for freezers being a necessity please reply. The compressor will not be happy. It needs the line to be coiled to operate properly. Be prepared to replace it down the road. Thanks for the heads up. I got such a great deal on the fridge I had to make it fit. Hopefully it will last at least a year and then I will downsize.